Bible verses and promises give us hope now and for the future. God is faithful and His mercies are new every morning. His promises give us something to look forward to. God's promises fill us with strength and remind us of who we are in Him. The promises of the Father kept Jesus on the cross for the joy that was set before Him. Now we can encourage one another with promises from God to build one another up in the Lord. Gal 4:3-5 But when the fullness of the time had come, God sent forth His Son, born of a woman, born under the law, to redeem those who were under the law, that we might receive the adoption as sons. John 3:15+16 That whosoever believes in him should not perish, but have eternal life. For God so loved the world, that he gave his only begotten Son, that whosoever believes in him should not perish, but have everlasting life. John 11:25-26 Jesus said to her,"I am the resurrection and the life. He who believes in Me, though he may die, he shall live. And whoever lives and believes in Me shall never die. Do you believe this?" 1 John 5:1-2 Whoever believes that Jesus is the Christ is born of God, and everyone who loves Him who begot also loves him who is begotten of Him. By this we know that we love the children of God, when we love God and keep His commandments. 1 Cor 6:20 For you were bought at a price; therefore glorify God in your body and in your spirit, which are God's. Acts 2:21 And it shall come to pass That whoever calls on the name of the Lord Shall be saved. 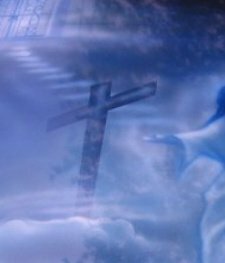 Acts 10:43 To Him all the prophets witness that, through His name, whoever believes in Him will receive remission of sins." Matt 9:2 be of good cheer; your sins are forgiven you." Heb 13:5- For He Himself has said, "I will never leave you nor forsake you." Rev 22:17 And the Spirit and the bride say, "Come!" And let him who hears say, "Come!" And let him who thirsts come. Whoever desires, let him take the water of life freely. When you have faced some kind of a trail, temptation or problem maybe you have been helped directly from the Word of God. Do you treasure particular scriptures that have been a strength to you? You could help others simply by sharing those scriptures with them. Maybe you have some,"thems fighten words" spiritual warfare Scriptures that are your favorite sword of the Spirit words. We'd love it if you'd like to pass those on to us. We encourage you to share them! Maybe there is a story behind them of how they have helped you fight the enemy. If you like, you could add a story or comment about them. Certain Bible verses can influenced people in many different ways. For your convenience we have provided a handy Bible tool at the bottom of this page to look up scriptures quickly and easily if you like. Let your voice be heard. As children of the living God the all the promises in the Bible belong to us. We will be blessed by your input. We Thank you in advance for taking the time to bless us with you favorite Word of God. Gods faithfulness will not waver. We would love to hear about the promises of God, your favorite Bible Verses or Bible Studies. Feel free to share and give glory to God. It's Free, it's easy, and it's your chance to be heard! This page can become your own web page that will be published as a part of this web site. It's easy and fun. Your story will appear on a Web page when you enter it here. You can wrap a word in square brackets to make it appear bold. For example [my story] would show as my story on the Web page containing your story. What other visitors have said.